Here's an eerie optical illusion you are sure to enjoy! It's quick to print, and easy to build. The skeleton's ENTIRE HEAD will seem to turn as you walk by, following your every move. Plus, the base is designed to serve as a gift box or storage box. This is a very unique little toy! Place the sculpture a little below eye level on a flat surface in a location where both sides of the head will be evenly illuminated - without any glare. Relax and look into the character's eyes for a few moments. Enjoy his deep penetrating gaze. Now lean or step away, to the left or right. The sculpture's head should seem to turn, following your motions. Lean up or down and his head will seem to move that way as well. 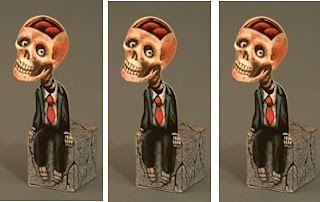 Place this little fellow on a shelf or in a corner somewhere for the Halloween season, and he is sure to amaze everyone who walks by.